- Adjustable to fit any book jacket size. - Paper backing for added protection. - Perforated folding guides assure accurate fit. Our best selling Adjustable Book Jacket Cover. Mani-Fold Book Jacket Covers both highlight and protect publisher's book jackets. Simply slip the book jacket between the crystal-clear 1.5 mil polyester film and white paper backing. The polyester film protects the outside while the paper backing adds firmess to the jacket and protects the inside from abrasion. Perforated folding guides on the paper backing assures fast, efficient and accurate fitting. Pressure-sensitive anchor tape tab holds creased film in exact position for attaching book and frees your hands for faster application. Dispenser boxes of 25 or 50. Our convenient dispenser box provides easy access to Mani-Fold. 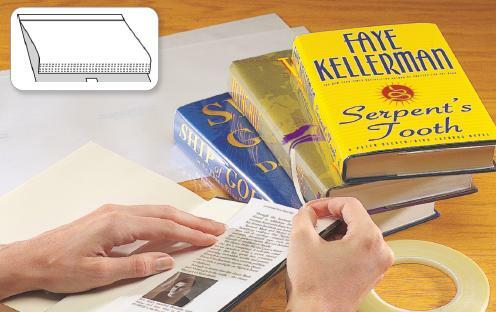 It offers a safe, secure way to protect book jacket covers from damage.